Indiewire had it’s End of Year Critics Poll and Guy Pearce and Robert Pattinson were included for their performances in The Rover. I’ve included the critics box so you can see how they voted. 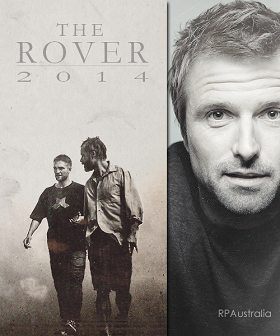 “Few films this year have been as dark and despairing as The Rover. 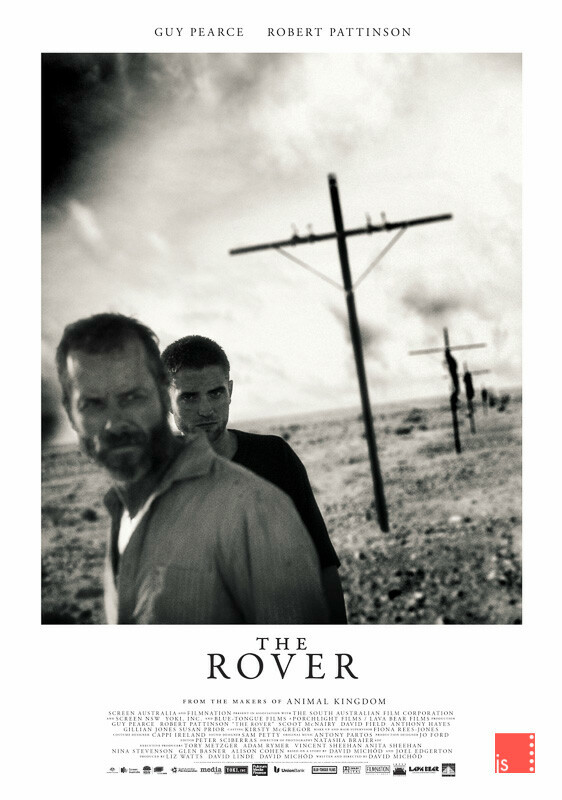 Taking place ten years after the collapse of all society, The Rover is a tale of survival and the violent trepidation of enduring life in a desolate and violently lawless world. Anguish, death, and the loss of human morals are forces to be reckoned with at every corner, presenting an indistinguishable line between desperation and immorality. Thanks Suze for sending to me. 6. “Blue Ruin” and “The Rover.” … “Rover” is a grim Aussie film, mildly post-apocalyptic, in which Guy Pearce and Robert Pattinson make an uneasy duo. Director David Michod strips everything down so that all details matter — including the payoff of the last 60 seconds. “I’ll be frank – this film hasn’t stood the test of time in the six months since it opened the Sydney Film Festival. David Michôd’s second feature burned up a lot of the hype and goodwill that followed his frighteningly accomplished debut Animal Kingdom. By contrast, The Rover is a slight movie – an overextended version of the short films that members of the Blue-Tongue Films collective have excelled at in the past. But The Rover mesmerised me, and Guy Pearce’s performance killed me. Michôd gets bleakness. I watched this in Los Angeles, where the dead midday pollution and endless highways made the film seem more realistic than apocalyptic. It rang true, and enthralled me for all its hundred and three minutes. And that’s why I go to the cinema. Thanks to @SaltyPopcornau for the heads up. After all the attention Andrew David Michod’s debut feature Animal Kingdom rightly received, we logically assumed that The Rover would have appeared with a bit more fanfare. But while reviews were largely positive, Michod’s post-apocalyptic thriller sneaked out on a limited release in US cinemas. Guy Pearce stars as Eric, a seething, violently amoral man on the hunt for his car, which was stolen by a criminal gang. Along the way, Eric forms an uneasy partnership with the gentle, easily-led Rey (Robert Pattinson), a gang member injured and left behind during their escape. What follows is a minimalistic, moody and occasionally brutal film. 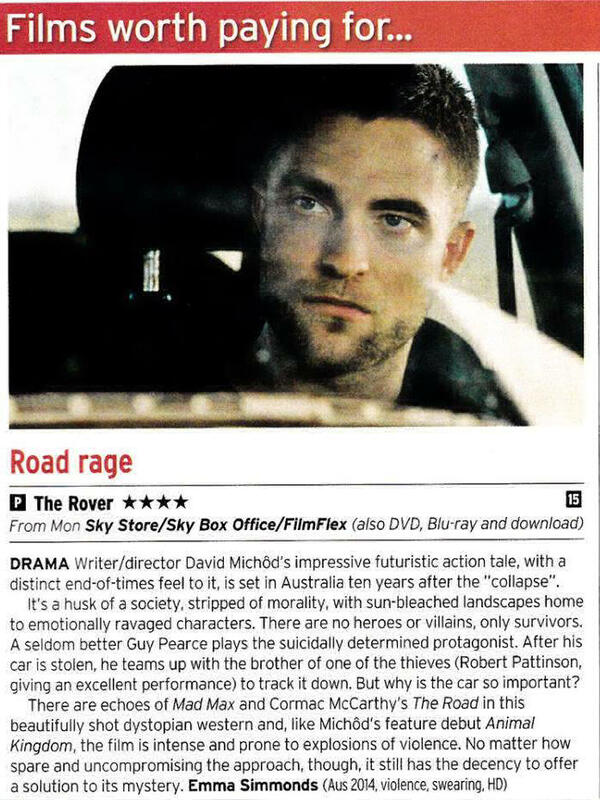 The Rover’s Australian setting and dusty roads have drawn inevitable comparisons to Mad Max, but Michod’s film has its own stark and meditative atmosphere, with some superb, contrasting performances from Pearce and Pattinson. The Rover also sees Pearce engaged in a confrontation with a group of a disgruntled circus performers, which isn’t something we were expecting to see in a bleak, post-societal collapse road movie. Posted in Sites / Blogs, The RoverTagged David Michôd, Director, Guy Pearce, Robert Pattinson, The RoverBookmark the permalink. I do love this poster – better than our one I think – thanks for the mention! !